Despite its promotion of “100 percent Americanism,” the Washington state Klan proved that its commitment to white supremacy trumped its commitment to American nationalism when it organized local chapters of the Royal Riders of the Red Robe. 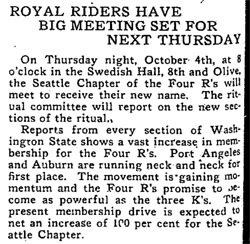 The Royal Riders were a Ku Klux Klan auxiliary for people who were “Anglo-Saxon” and English-speaking but not technically native-born American citizens. While many Royal Riders chapters were in the United States, the KKK also organized chapters in Canada. Some of the earliest documented Klan organizing in Canada occurred in British Columbia in November, 1921, at roughly the same time that organizers first began working in Washington state. The Royal Riders of the Red Robe was only nominally a separate organization from the Klan. It was listed in the Klan’s Pacific Northwest Domain Directory, shared an office with Seattle Klan Local 4, and had its meetings with similar rituals in the same places as the Seattle Klan. 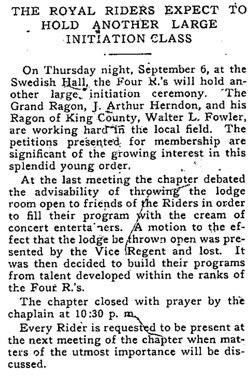 Beginning in 1923, Klan events and propaganda came to regularly feature Royal Rider initiations and news. 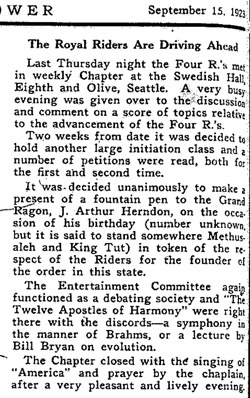 The Grand Ragon (as opposed to the Klan’s Grand Dragon) of the Pacific Northwest Realm of the Royal Riders of the Red Robe was J. Arthur Herdon, and the King County Ragon was Walter L. Fowler. 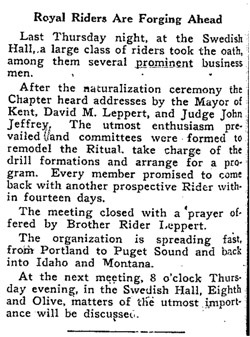 Naturalized but not native-born citizens in Seattle’s Royal Riders were organized into another Klan Auxiliary, the American Krusaders, on October 18, 1923. Alongside this growth in Washington came the growth of the Royal Riders of the Red Robe in British Columbia. King Kleagle Luther Powell is known to have established a chapter of the Riders in Vancouver, and sought to also found a women’s auxiliary in Victoria. Some speculate, though it has never been proven, that Canadian members of the Ku Klux Klan assassinated Peter Verigin in 1924 to prevent him from moving his pacifist commune of Russian immigrants from British Columbia to Oregon. On October 30, 1925, as many as five hundred people gathered to watch members of the Invisible Empire of the Kanadian Knights of the Ku Klux Klan, the organization founded after expelling Powell from Vancouver’s Klan, as they marched through the streets of Vancouver. A more definitive history of these interconnected secret societies in the Pacific Northwest remains to be written.